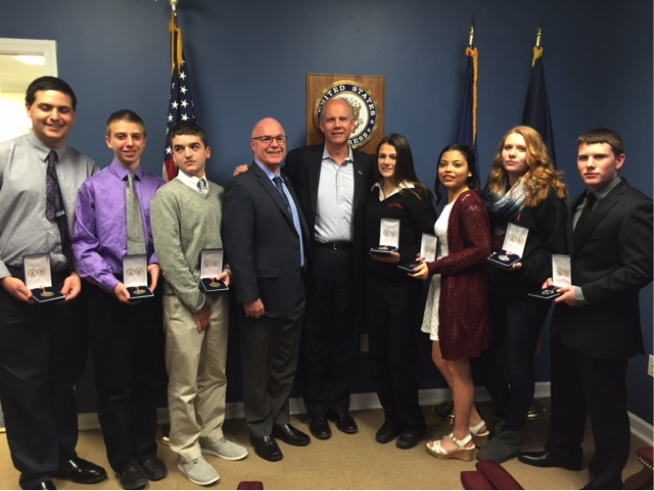 The Maverick Foundation is proud to announce that seven of our scholarship recipients were recognized for their achievements with the Congressional Award Program by Congressman Dan Donovan at his office. From Moore Catholic High School, Sarah Primiano, a senior, received the Silver Medal, while Genevieve Bruen, a junior, and Kristen Blanchard, a sophomore, received Bronze Medals. Sarah, Genevieve, and Kristen are recipients of the Gullickson McGuire Memorial Scholarship in memory of Joe Gullickson who made the ultimate sacrifice with the FDNY on 9/11 and Dan McGuire, who tragically lost his life in an automobile accident in 1976. Dan was a student and captain of the track team with the class of 1977 while Joe graduated with the class of 1982. From Saint Peter’s High School, Thomas Walsh, a senior, received the Silver Medal, while Santo Tiralosi, a junior, and Peter Rotondo and Frank Pizzella, who are both sophomores, received Bronze Medals. Thomas and Peter are recipients of the Bill Hodge Memorial Scholarship who was an iconic figure in track and field community and for decades inspired generations of runners to “live to the max” not just in running but in life. Santo and Frank are recipients of the Terry Sweeny Memorial Scholarship who was a diehard Saint Peter’s Eagle who lived strong with grace and courage despite a debilitating disease. The Maverick Foundation is proud of these wonderful role models who achieved this significant recognition each in their own unique way that required persistence and dedication. We are especially proud of the efforts all made to help others and volunteer in the community. This group collectively volunteered over 1,850 hours. Wow! The Maverick Foundation will again be offering these scholarships this year. Interested 8th graders are encouraged to visit our website to learn more and apply. The Maverick Foundation will be having our flagship Lt. Joe Gullickson Memorial Picnic on Saturday, June 25, 2016 from 12:00 to 6:00 PM at Nansen Park. Save the date! Thank you for your interest in the Maverick Foundation!